Theatre company managers who operate their own venues have an incredibly valuable resource in the form of the spaces themselves. We recently spoke with Anetha and Olivia from VenueBook about ways theatre companies can further leverage their venues. VenueBook matches event planners with their perfect venue. Planners can search using a host of criteria including size of venue, available dates, and a whole host of included amenities. VenueBook also provides accurate pricing without having to enter into long negotiations. Contracts and transactions are handled within the platform. In addition, VenueBook provides a Venue Management portal through which venues can manage their event bookings. It’s like Airbnb, only for large venues instead of homes. They currently operate in New York, Chicago, DC and San Francisco. Anetha also mentioned that event planners typically book up restaurants first. Once the restaurants are all spoken for they’re not sure where to turn next. This got us thinking about the potential our spaces have to meet this need. We have theaters for presentations and meetings, rehearsal halls for dinners, and lobbies for cocktail hours. Many theatre companies already rent out their spaces, but Venue Book showed us a way to potentially connect with many more people out there looking for a venue to host their event. 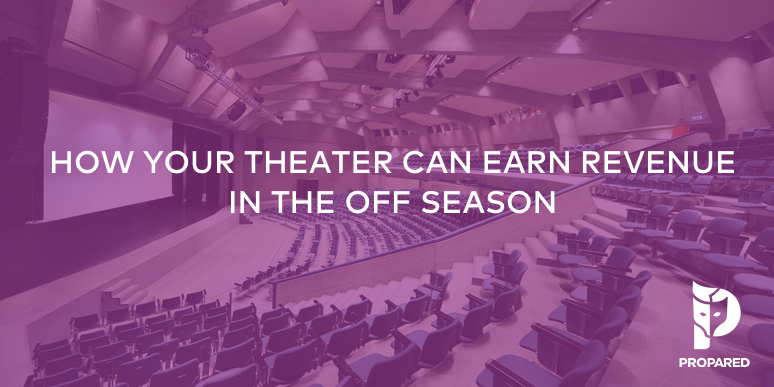 In addition to the obvious benefit of additional revenue, renting the theatre to a more diverse set of clients can open up new avenues of potential audience members. After all, they’re actually coming to your house! It’s a great time to welcome newcommers. How about an agreement with the event planner to be able to distribute material for upcoming shows or offer ticket giveaways for live auctions and fundraisers hosted there? In hosting events, your theatre company is also becoming a more important part of the community. There are lots of event planners searching for the perfect venue, and we have lots of theatres that aren’t being utilized 24 hours a day. Fortunately, there are many tools, like VenueBook, available to make connections easier. It’s a wonderful way to extend the spirit of the stage, and an equally wonderful way to help finance your overall operation.